Lagos – The students of the Lagos State University (LASU) have taken their campaign to the social media, with the launch of #SaveLASU on twitter, which has become one of the trending issues on the platform. The students are demanding the immediate reopening of the school registration portal and reversal of the school fee hike. They have also tasked the Lagos state government to improve the funding of the institution. 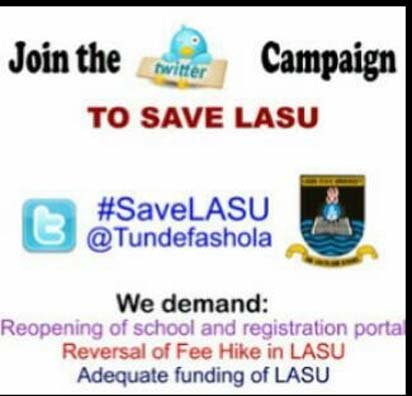 Some of the popular posts by the students include, “#SaveLASU @tundefashola, we demand: reopening of school and registration portal, reversal of fee hike in LASU, adequate funding of LASU”, “@APCNigeria, tell your party to make education affordable for the poor by reversing the fee hike in LASU #SaveLASU”, “An estimate of 1292 LASU students are denied registration. Education is a right not a privilege. #SaveLASU”, “Do what you can, with what you have, where you are- Theodore Roosevelt. #SaveLASU @tundefashola, history beckons, Pa. Jakande did his. @Ilooklikeagirl tweeted, “After six months of being at home, we deserve a smooth semester not another interruption, #SaveLASU”. Some of the students who spoke with our correspondent, pleading that their names should not be in print for the fear of victimization, argued that there is no justification for the continue closure of the school, accusing the Vice-Chancellor, Prof. John Obafunwa of exaggeration when he stated that properties destroyed were unquantifiable. They also alleged that the properties were destroyed by hoodlums who hijacked the protest, following the VC failure to address the students on the fateful day. A top member of the SUG in transition, who does not want his name in print, also accused the Fashola led government of intimidation and harassment. “They (the Lagos State Government) are after us. They are intimidating us into signing some documents. Is it a crime to be a LASUITE? The school is the most expensive government-owned university in Nigeria and we are not getting value for the money. How can you increase tuition fee from N25, 000 to N350, 000 without anything to show for it? Fashola, Ikuforiji, Adefulire and others had free or subsidized education, why can’t they also do same for us?” he queried. He also called on the Speaker of the Lagos State House of Assembly, Rt. Hon. Adeyemi Ikuforiji to call members of the parliament to order, noting that a lawmaker addressed students of LASU as thugs during the hearing conveyed by the assembly. It will be recalled that the management of the Lagos State University (LASU) closed the state-owned university indefinitely following what it termed ‘violent protest by the students”. The decision was contained in a bulletin, dated 23rd January, 2013, titled LASU management Closes University indefinitely. The statement reads, “In the wake of the violent protest by some affected students of Lagos State University (LASU) over the closure of the university portal for registration of courses for rain semester 2012/2013 examination, the university management has decided to shut down the university indefinitely. Also, examinations have been put off till further notice. With this decision, students are expected to vacate the university premises until further notice”. The students had staged a peaceful protest on Wednesday, 22nd January over the closure of the registration portal but the protest became violent the following day, with properties destroyed. This came a day after the Speaker of the Lagos State House of Assembly; Rt. Hon. Adeyemi Ikuforiji lauded the students’ union for using the e-voting system to elect their officers and advised the Prof. Jega led Independent Electoral Commission (INEC) to take a cue from the students and organize a credible e-voting elections in the country comes 2015.